In Deland, Florida, Kolter launched Cresswind at Victoria Garden, a private, gated, active adult community located 20 minutes from New Smyrna Beach and 30 minutes from Orlando. 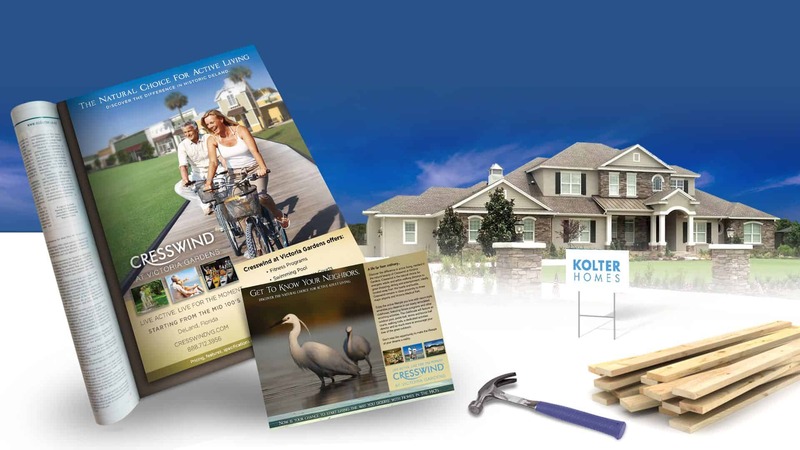 Kolter had strong corporate brand standards, but messaging needed to resonate with the target audience and convey the points of difference and unique selling points of the community. For the target, proximity to continuing education, libraries, hospitals and grocers were all strong selling points—location, location, location. Primarily print, with digital and outdoor supporting our efforts, photography was key to the creative development. Both B2B and B2C collateral was developed, from realtor brochures to consumer fliers, elevation sell sheets and maps, a family of complementary was essential in yielding an ROI for the home builder. Utilizing IP address caching, an opt-in email marketing campaign, geo-fencing and recorded series of phone numbers, we were able to track from awareness through the sales funnel, all the way to conversion, providing a measured cost per acquisition, or in this case, a “cost per close,” under the industry standard.